On November 12, 2015, the Financial Accounting Standards Board (FASB) voted to proceed with a final standard for lease accounting. This new standard requires companies to include lease obligations on their balance sheets. The lease project was added to the FASB’s joint agenda with the International Accounting Standards Board (IASB) in response to concerns from investors, financial statement users, and the U.S. Securities and Exchange Commission (SEC) regarding the lack of transparency relating to material lease obligations that have been reported off-balance sheet. 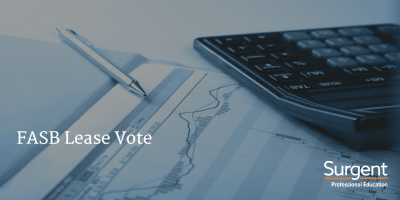 The FASB’s next step is to complete a “ballot draft” of the lease standard that includes all of the Board’s final decisions. Each of the seven Board members will review the ballot draft to ensure that it accurately reflects all decisions made throughout the public deliberations. Once satisfied, the Board will submit the draft to production for final publication. The decision to issue the final standard followed extensive stakeholder outreach. The FASB received more than 1,740 comment letters on a 2009 Discussion Paper and two Exposure Drafts (2010 and 2013), and participated in more than 200 meetings with financial statement preparers and users. Additionally, the FASB hosted 15 public roundtables, 15 preparer workshops, and 14 meetings with practitioners, standard setters, and other interested parties. The final standard should be published in early 2016, providing financial statement preparers sufficient time to review and prepare for the changes by the effective dates. The standard will be effective for fiscal years beginning after December 15, 2018, for public companies. For private companies, the standard will be effective for annual periods beginning after December 15, 2019. Early adoption will be permitted upon issuance of the standard. Therefore, the material will be testable on the CPA exam in the later of (1) the first testing window beginning after the pronouncement’s earliest mandatory effective date or (2) the first testing window beginning 6 months after the pronouncement’s issuance date. In either case, there will be a simultaneous introduction of content related to the new pronouncement and removal of content related to the previous pronouncement. For more industry updates that could affect material tested on the CPA Exam, subscribe to the Surgent CPA Review blog, Passing Insights.